As the sun rose, I drove down through the Galilee region, made my way to the Dead Sea and then cut west to arrive in Jerusalem mid-morning. After dropping the rental car off, I hopped a bus and arrived back where I started at the Abraham Hostel in West Jerusalem. I was given my room key and found that I was in the same room as before and in fact had the same bed! There is something that puts me at ease when I find a bit of familiarity in the midst of traveling a foreign country. The Abraham Hostel is a fantastic hostel, heralded as one of the best in the world. People of all ages and countries stay there. There were church tour groups with seniors and young people in the midst of traveling the world, and everything in between. After the sumptuous seven-course breakfast served at the inn, I took a stroll around the corner to pay a visit to the Cana Wedding Chapel where Jesus is heralded as performing his first miracle, changing water into wine. The front of the church is situated along a narrow cobbled alleyway that leads to three Catholic churches and a handful of tourist vendor shops. After visiting the wedding chapel, I wandered up the alley. The church at the top of the alley was not open, so I wandered around the grounds and came upon the most resplendent rose bush. The flowers were a brilliant and stunning shade of red. I had to touch the leaves because I thought that perhaps they were made of velvet. The entire bush was covered with roses in full bloom, each rose perfect and beautiful in the design of how its petals unfurled. In Tiberias, houses and apartments are stacked on a hill like a wedding cake overlooking the Sea of Galilee. In Cana, they are stacked more like pancakes overlooking Main Street. The streets are one lane alleys that branch out and snake up the hill, much like veins coming off an artery. Turning a corner is a 3-point turn - or more if you are not skilled. Meeting someone coming the other way means either they or I needed to go in reverse up or down the hill until we come to an intersecting vein. Finding my lodgings was like finding a needle in a haystack. Google Maps proved useless, as all it directed me to do was turn off from the main road onto a straight road that would lead me directly to the inn. Ha. There we no street signs. There were no street names for that matter. After driving the alleys for more than an hour, I experienced my own miracle in Cana. My last day by the Sea of Galilee. I began at Tabgha, the location where Jesus is reputed to have served 5,000 with five loaves and two fish. There was now a big church on the spot. Underneath the altar, encased in glass, was the rock that the loaves and fish rested upon. It is remarkable the close proximity of all the locations where Jesus held his ministry. You could walk to all of them within a day’s time. Tabgha is a short walk from Capernum and not far from Ginosar and Migdal. A little further up the hill is the Mount of the Beatitudes where Jesus gave his infamous sermon on the mount. So up the hill I went only to discover that the gates to the Mount of Beatitudes were shut for lunch. I decided to move on and visit Safed, a town several Jewish roommates had told me about, as well as my host at the Airbnb. They all said that I must go there, so off I went. Shalom Shabbat (Saturday has arrived once more). I woke feeling especially exhausted and lay in bed a while feeling a bout of travel fatigue. A day of rest for everyone here in Israel, I created a plan for how I could do the same. I began my day at the infamous Tiberias Hot Springs, a destination location for more than 2,000 years for royalty and weary international travelers. There were two heated pools teeming with minerals. After immersing myself in the first pool and floating for half an hour, I took a cold outdoor shower and then plunged into the next pool. After, I found myself in a lounge chair on a deck overlooking the Galilee. It was the perfect beginning to my day. Heading up the coast again, I thought to stop at the small park I had found in Migdal yesterday and then head back up to the National Park at the Northern end of the Galilee. In both places, I was looking for a nice tree to lean against and to relax by the water. As I was passing the archeological site in Migdal, I noticed it was open! Sitting on the penthouse deck of the Air BnB where I was staying, and beholding the Sea of Galilee laid out before me, I contemplated where to begin and how to open a portal into a time and people when Jesus ministered along its banks and stirred the soul of a people. From the city of Tiberias, the city Herod founded and built and moved to in 19 AD, I began my trek. Heading north, my car hugged the western banks of the Galilee. First I came to Migdal, hometown of Mary Magdalene. I had not realized it was right on the coastline and so close to the major pilgrimage sites for Christians. I got off and came to the site of the old town. It was closed due to massive construction of a large hotel, restaurant and grounds that will become a major center for Christian pilgrims. After a day at the top of the cliffs at Masada, it was time to immerse myself in the sea. Making my way to Kaliya Beach, I changed into my swimsuit and began the trek down the steps to the shoreline. The Dead Sea waterline is currently 40 feet below normal. With global warming, it is anticipated the sea will dry up all together one day in the not too distant future. But for now, there is plenty of sea and salt and mud for all who make their way here. Arriving near the end of the day as the sun was sinking low, the day’s tourists had come and gone. When I arrived at the shoreline, it was me and a group of women from Belarus (Russia) and a group from Ghana. Hugging the coastline, I drove the length of the upper part of the Dead Sea. Timeless and untouched by human endeavor, except for the road and a handful of beaches and palm orchards. The stillness of the Dead Sea lay at the feet of the towering mountains and craggy cliff faces. My destination: Masada. 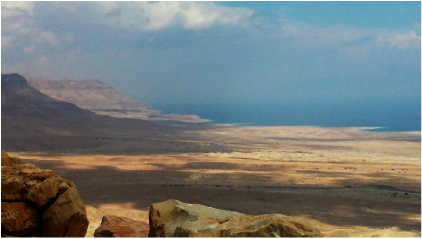 A plateau atop one of the mountain ranges discovered by Herod. Wanting a retreat from the world, he had built a palace and fortress here in the 1st century BCE. After Jerusalem fell in 70 ACE, about 1000 zealots and refugees retreated to this mighty city in the middle of what could be called nowhere, yet felt more like the middle of God’s creation - majestic, barren, stark and utterly breathtaking in its beauty. I left the stone walls and bustle of Jerusalem behind me. Within only a few miles outside the city, I met a vast desert of rolling golden hills. I drank in the stark beauty and great expanse of blue sky and layer upon layer of towering hills. 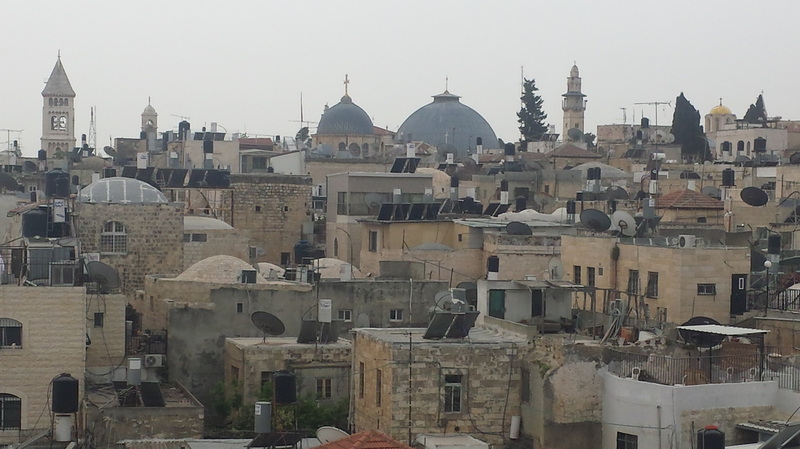 After being in the Old City were everything is compact and close, my eyes were adjusting to distance and endless horizon. Soon I was traveling on a road that wound and turned and then went down and down. I drove past a town called “Sea Level” and concluded I was about to go below the level of the sea. Turning a bend there was a bowl of blue over the barren hills. It was the Dead Sea. Sapphire blue, its beauty startling in contrast to the endless desert hills. After being refreshed and rejuvenated among the olive trees yesterday, I was ready to lose myself in the belly of the old city again. Arriving early, I was pleased to walk the streets before the vendors set up shop and the bustle of the day began. After the weekend, the city was quieter overall and having become oriented to the streets and movements of the city, I felt more at home. Some of the vendors even remembered me. If I ventured in the wrong direction, I would recognize a street I could take to get myself back. Knowing the basics of getting around was no small feat and had come with clocking about 16 hours of walking during my first two days in the old city. I set out to spend the day on the Mount of Olives, a hill that sloped down to the Lion’s Gate, the east entrance, and offered a panoramic view of the old city and a spectacular view of the Temple Mount and Mosque with the Golden Dome. When Jesus arrived in Jerusalem from Bethany he came down this hill and entered the East Gate which the prophets has was the Gate the Messiah would come through riding a donkey (since the Jewish people are still awaiting the Messiah, the Muslims have sealed this gate so there will be no easy entry). And after the last Supper, Jesus prayed the Garden of Gethsemane, the place where Judas kissed him on the cheek and he was arrested. And on the Mount of Olives, Jesus ascended into heaven. I have wondered if the Mount of Olives was a special place to Jesus beyond the times listed in the Bible. From the summit of the hill, there is an extraordinary view of the old city and especially of the Temple Mount and what would then have been a glorious temple. As I sat at the top of the Mount, I imagined Jesus sitting up here and looking out at a city that was dear to his heart and the temple that was central to his religion and people. As Bethany is just on the other side of the hill, he could easily have come to stay at Mary, Martha and Lazarus’ home and then slip away to come prayer and sit at the top of this hill. Shabbath Shalom! As it was the Sabbath, public transportation was down and the streets of West Jerusalem empty as I walked towards the old city. Entering through the Jaffa Gate, I again climbed to the ramparts, and this time walked atop the city walls from the west to north side. I had great views of the city and could watch the activity below. After stepping down into the city near the beginning of the Via Delorosa, I entered first the small and elaborately decorated church of St. Anne, Mary’s Mother, run as part of a convent of Greek Orthodox nuns. I delighted in the paintings of Jesus’ grandmother and her husband Joachim. In one painting, they are embracing and there is an expression of joy in each other. In another, a small Mary stands between them. She is perched on a small tree. The Via Dolorosa, the road representing the path Jesus took carrying the cross to Golgotha, begins in the Muslim quarter and winds, mostly uphill on a steep incline, into the Christian Quarter. All along the route is the bustle of modern Bethlehem, with vendors calling out inviting you into their shop to buy a trinket. Shalom. I have arrived! Palm trees lined the roadway from Tel Aviv to West Jerusalem. . I am staying in an Orthodox Jewish neighborhood west of the old city. I marveled how -even in the heat - women wear all black with long sleeves, long skirts - no pants, no arms showing, an occasional color but no printed or bright fabrics. I changed money into shekels. Slept two hours. Had a falafel. Met my roommates: from Poland, Norway, and one who is applying for Israeli citizenship. Went back to bed at 11 pm (4 pm my time at home) and slept the night! I made my way to the old city, entering through the Jaffa Gate – one of seven gates - and immediately climbed the stairs to walk the ramparts (the pathway that runs across the top of the walls encircling the city which operated as military outposts to view anyone approaching or leaving the city). I have just passed through airport security and am sitting waiting for my flight. Passport in hand. My passport lists countries journeyed and is a key that opens a passage to unknown territories and adventure. Similarly, I have a passport of my journeys with the women of the Gospels. The research, contemplation and giving them a voice through the one-woman plays I have created, have like a key, opened a passageway to an experience of what it may have been like to walk the roads of Israel with Jesus, bringing to life the extraordinary times and events of His ministry. And through this, my relationship to Jesus had deepened and His teachings opened my heart. The more his ministry comes alive, the more I become more alive. And yet, I have never set foot on the Holy Land. And yet, I have never set foot on the Holy Land. For the last months I read everything on Mary Magdalene that I could get my hands on: theological essays, historical interpretations, books people gifted or recommended. Combined, these have given me my passport for the journey I am now taking. As I contemplate where I am going, I look to where I began. In my lifetime, Mary Magdalene has gone from being perceived as a Prostitute to being recognized as Beloved by Jesus. Her mythos, her role in Early Christianity is undergoing a phenomenal shift in the minds and hearts of Christians and non-Christians alike as there is a collective understanding that she was never a prostitute and a collective inquiry into her true character and the nature of her role in the ministry of Jesus and early Christianity. In 591 AD Pope Gregory the Great gave a homily declaring Mary Magdalene a Prostitute. For several years, at churches and retreat centers across the US and beyond, the topic of Mary Magdalene usually emerges at some point in conversation. Who was she? She is no longer held as a prostitute. Why was she at all? Is she married to Jesus? Or His lover? Was she married before? Is she celibate? Was she a leader in the early Christian church? Was she considered an apostle? What role does Mary Magdalene play for women and the sacred feminine within a spiritual life then and now? I have been contemplating this last question for the last year with the intention of writing a one-woman play portraying Mary Magdalene. For a year now I have read every theological and historical interpretation I can find on her. There is a wide range of views about who this woman was. Through my exploration, I am hearing the voice of many different Mary Magdalenes. I have been feeling compelled to give her a voice, after millennia of being misrepresented and often degraded, I want to hear what is important for her to say about her life, the life of Jesus and the ministry that she served and still serves today. It came to me some months ago that I will know what to write once I stand on the shores and look out at the Sea of Galilee. And so...on April 6, 2016 I am on a plane to Israel....in search of Mary Magdalene. I hope you will join me for my journey. I will be, with luck, doing a blog post daily of my explorations, discoveries and incorporate tidbits from research I have done up to this point. Please forward this blog to those who you think will enjoy this. I welcome your comments and your support along the way. Sign up for the mailing list to receive notices of when blogs post on the right side of this page. If you understand RSS Feed, then click on this option and you will get notices this way. This is a travel blog of a journey to the Holy Land I am undertaking to discover Mary Magdalene - who she was when she walked alongside Jesus and who she has become in our collective heart and culture. The result of the journey will be a one woman play. This will be my fifth one woman play portraying Bible Women. I have performed these plays to churches of all denominations through the US and internationally. Sign up to our mailing list to receive blog updates.